This is one of the creatures from my Fifty Fiends project. 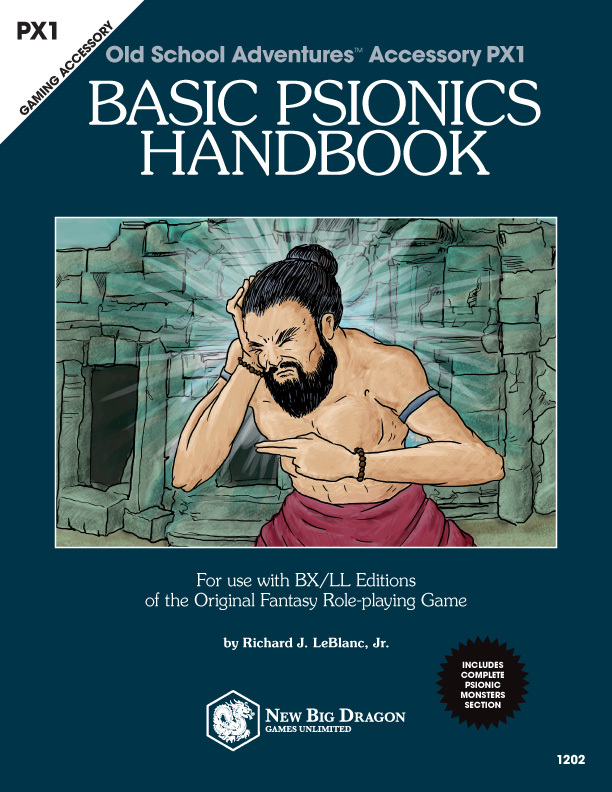 Please note, it also uses one of my new psionic Treasure Type designations. Silent Scream. Although the holsohr are voiceless, they are able to emit a silent “roar” of sonic distortion in a 60' long radius and a 180° arc. 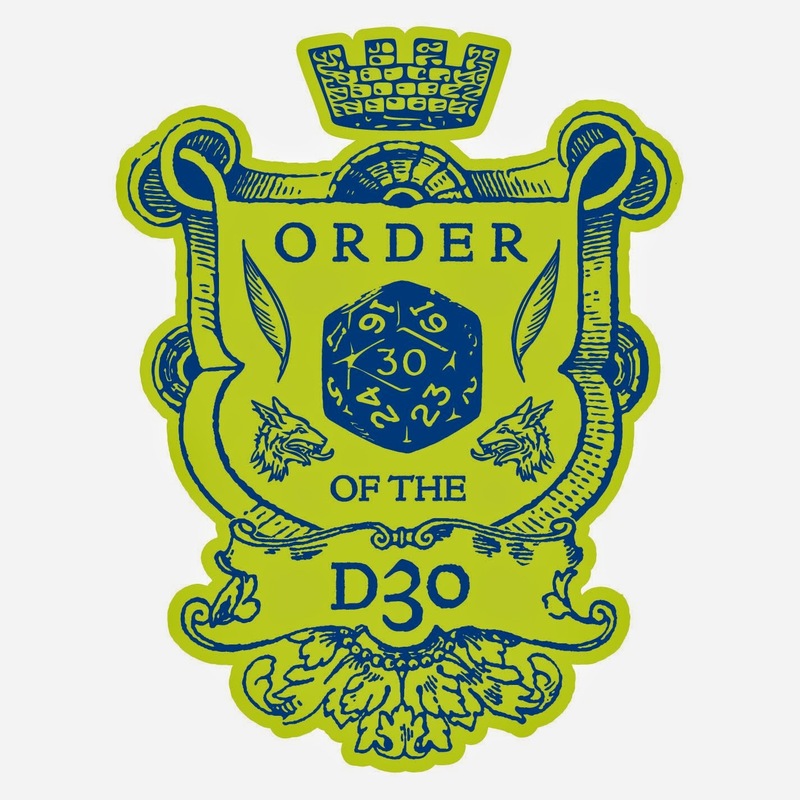 All creatures caught within in the area take take 4d6 damage; a successful save vs. breath halves this damage. This ability is usable 3×/day. Phobia Aura. In addition to possessing the telepathic devotion phobia ampli cation, holsohr are always surrounded by a 30' radius effect equal to that ability. All creatures caught within the area must make a psionic saving throw or suffer the effects for a duration of 2 turns. Phobia Reflection. This ability is similar to the illusionist spell alter self, except that all creatures that view the holsohr will see it as the living embodiment of their greatest fear. A psionic saving throw results in the creature being able to see the holsohr as it truly is. This ability is usable 3×/day and has a duration of 1 hour (6 turns). Cause Nightmares. At will, a holsohr may touch a sleeping victim and cause it to have nightmares. On a failed psionic saving throw, the sleeping victim will be wracked with nightmares and restless sleep. When the victim wakes, it will have gained none of the ben ts from such a period of sleep (e.g., natural healing can- not take place, spells cannot be memorized, etc.). If the victim is woken, the nightmares will be disrupted and the victim may then return to restful sleep. The holsohr must be in the same plane as the actual body of the victim for this ability to work (e.g., the holsohr may not reach into the Prime Material from the Dream Plane to use this ability). Appearance. These dreadful creatures are a horror to behold. 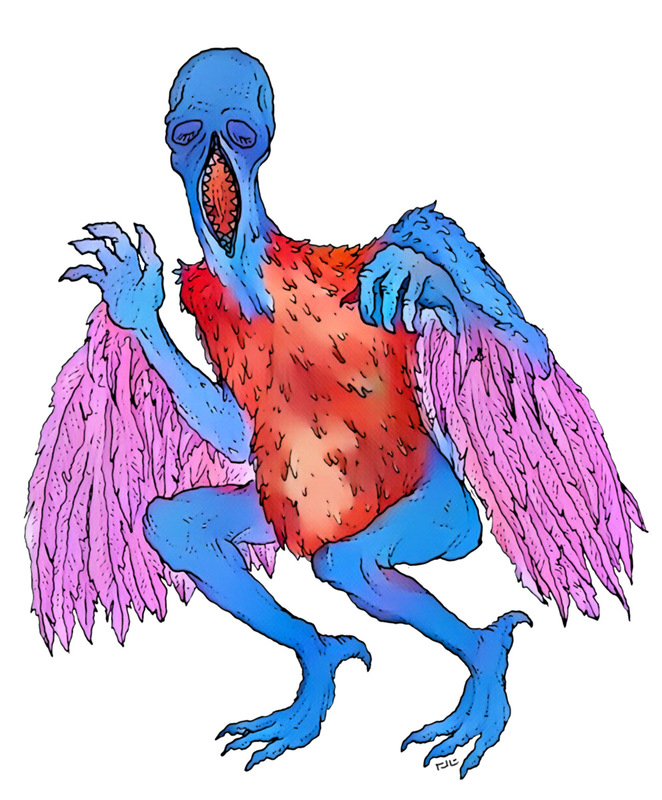 A holsohr’s body is generally humanoid in form, but its extremities feature bird-like hands and feet, its arms and torso are covered with feathers, and it wings are composed of long feathers. The head of a holsohr appears as a human skull with sunken eyes and a ghastly, fang-filled, vertically- set mouth that extends down its elongated neck. Ecology. Holsohr are native to Melas Oneiros (the Black Dream realm of the Dream Lands)—the place where the most terrifying and dreadful of nightmares are born. In fact, it is believed that the holsohr themselves were born into existence from nightmare. Holsohr prowl through Dream in search of the unattended bodies of dream travelers, through which the holsohr may escape from Dream into the plane occupied by the sleeper, in order to bring chaos, confusion and mayhem to the waking world. The holsohr are the sworn enemies of both baku and zowls. Languages. Holsohr are voiceless, communicating via a form of sign language (unique to the holshor). They do, however, understand common, auran, celestial, nocturne, primordial, and supernal. * Costs no PSPs to use.